Haqqislam-themed Bourak resin bases designed by Angel Giraldez! 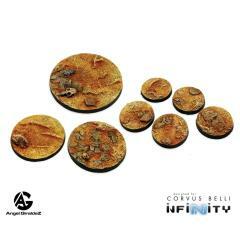 This set is designed in a desert sands and hardpan style for Infinity the Game. 5x 25mm, 2x 40mm, 1X 55mm, a full set of bases. The underside of the bases have sockets that you can use to magnetize for transport.